Send Beautiful Passionate Love to Chennai. Gifts to Chennai. Send Flowers to Chennai. Description : Present this beautiful bouquet of 15 red roses to your dear ones to celebrate their special day who lives in Chennai. Decorated with green leaves and presented in a beautiful glass vase, this bouquet will help you to convey your message of love and adoration to the recipient. 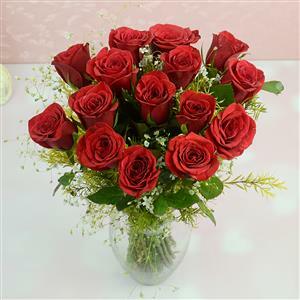 You can also send this charming bouquet to your loves ones along with other Gifts to Chennai through Gift2Chennai.com. Pleas Note: Glass vase may vary according to the availability.